In the Navy, the military police force rating is the Master at Arms (MA).MA’s are the Navy’s security and force protection professionals. This military base security job provides the Navy with security specialists who perform anti-terrorism, force protection, physical security, and law enforcement duties on land and at sea. Navy Military Police (MA) may operate a force protection watercraft, direct an investigation, control a base access point, or supervise a K-9 asset. Some specific MA duties include conducting waterborne security patrols, protecting oil platforms, managing base access, conducting base security patrols, law enforcement operations, providing protection for high-ranking dignitaries and government officials. They may also perform security inspections, conduct K-9 explosive and narcotics detection missions, organize and train security personnel, operate brigs (the Navy's version of jails), and conduct investigations and crime prevention programs. 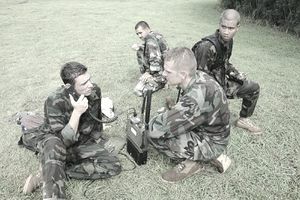 In 2003, the Navy Recruiting Command was assigned a new contract mission for entry-level applicants and started actively recruiting Master’s at Arms from its annual pool of candidates versus having to cross – train after several years in the Navy before able to become an MA. It takes roughly nine weeks to create a Navy Master at Arms. Their class "A" school is located in San Antonio, Texas. Naval Technical Training Center at Joint Base San Antonio. Joint Base San Antonio is the result of joining Lackland Air Force Base and the United States Army Fort Sam Houston, and the United States Air Force Randolph Air Force Base, which were merged on 1 October 2010. A master at arms may expect to be assigned to duty at shore stations in the U.S. and overseas; aboard ships as either ship’s company or security team; or as part of a maritime expeditionary security squadron. The work environment varies widely with individual assignments and country where deployed. Master at Arms personnel serve in security locations around the world and provide land and sea security in support of joint service operations. Once they've completed boot camp, recruits seeking law enforcement and security positions report to San Antonio, Texas for nine weeks of A-school training. They'll learn anti-terrorism techniques, crime prevention, civil law, communications, and receive firearms training. There are opportunities for the top students in the class to continue their training in specialized jobs within the rating, such as Dog handler. Those seeking a position as a master at arms need to achieve a combined score of 100 on the word knowledge (WK) and arithmetic reasoning (AR) segments of the Armed Services Vocational Aptitude Battery (ASVAB) test. They will also need to be able to qualify for a secret security clearance and be a U.S. citizen. They'll need a record free of nonjudicial punishments or convictions within three years of applying to be an MA. A domestic violence conviction disqualifies any MA candidate. Master at arms recruits should have a valid driver's license, no speech impediments, and are required to pass a drug test. They should have no history of mental disorders, alcoholism or drug abuse, and need normal color perception and vision correctable to 20/20. The master at arms rating is classified as an INUS/OUTUS (in the U.S./Outside the U.S.) community, which means that instead of being assigned to ships, many of their overseas assignments are classified as sea tour duty for sea/show flow purposes.